Jakarta has a rapid transit system. It’s fast, convenient, easy to ride, and of course… much cheaper than taking a multi-trip angkot (public vans, like a “songthaew”) or grabbing a taxi. 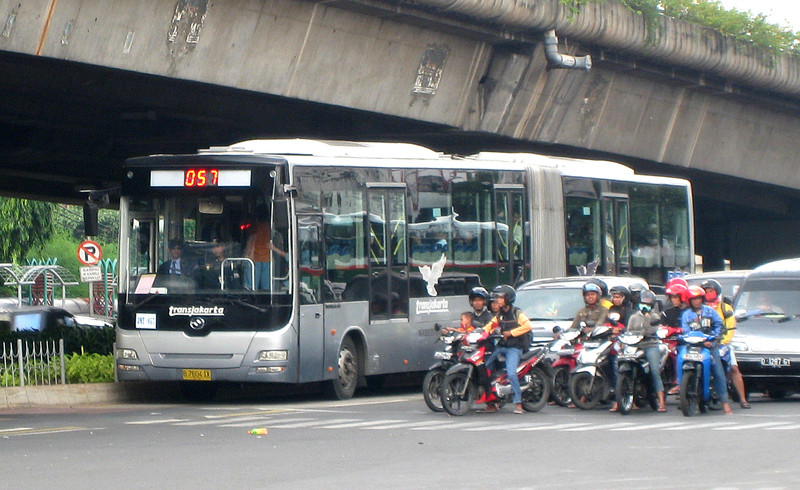 There are 2 forms of rapid transit in Jakarta: the bus rapid transit system TransJakarta and the rail-based rapid transit called Commuter Line. I embolden myself to write this article since I found out that the Commuter Line is less known for foreign travelers (even the domestic travelers and the Jakartans themselves). So, here we go. But first, I’ll write a few about TransJakarta. TransJakarta is a bus rapid transit system in Jakarta, serving the greater area with dedicated lanes / corridors throughout the city. Jakartans called this as “busway”. Yes, it’s a misperception, actually. Currently, TransJakarta has 12 lines / corridors. It has dedicated lanes which are prohibited for other form of public / private vehicles. Unfortunately some citizens don’t obey this rule, specifically happens on busy hours when every people are in a hurry. Update: Thanks to our latest governor, Basuki Tjahja Purnama, TransJakarta lines are now clearer than before, especially in Central Jakarta. If you want to take a TransJakarta, simply go to the nearest stop (called “halte” or “shelter”). Most shelters are located in the middle of a road or highway so you need to climb up the crossing bridge. Before entering the platform, there is a counter where Jakartans used to pay the fare. But currently almost all shelters use an electric card / e-ticketing system instead of cash. So, go to the counter, and tell the officer that you want to buy the card. Since most officers don’t speak English, please say, “Saya mau beli kartu” (I want to buy the card). It costs IDR 20.000. Now, you’re ready to hop on the bus. Wait, you’re not sure what line you should take? Ask the officers. Tell them your destination or the district name. 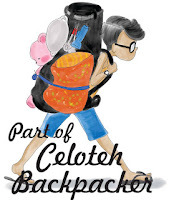 Jakarta is a big city, so you might find citizens who don’t know where the location you ask. Tap your card on the entry gate. Each trip costs IDR 3.500. Yes, no matter how far you’ll go, or how many transits you make. Enjoy the ride, they’re air conditioned with two rows of seat facing each other. But, I have to admit that some buses are not well air-conditioned, usually buses on less popular lines. So you might get sweaty inside the bus, moreover if you’re in the morning or evening where Jakarta meets its chaotic busy hours! Please avoid busy hours, Monday – Friday 05:00-09:00 AM and 04:00-08:00 PM or you will stuck in the middle of noisy and sweaty crowd. Each bus has its different color, from reddish-orange, grey, or blue. Some buses have two cars, like a light rail or electric tram, to carry more passengers. 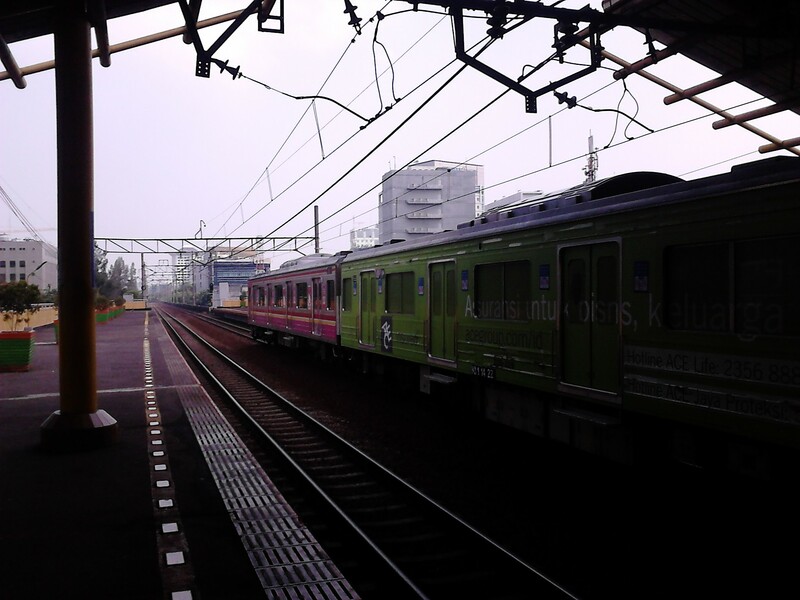 The most popular (and most convenient) line is the Blok M – Kota line. The buses are new, clean, and well air-conditioned. Update: New fleets use SCANIA buses. They’re safer and more comfortable. 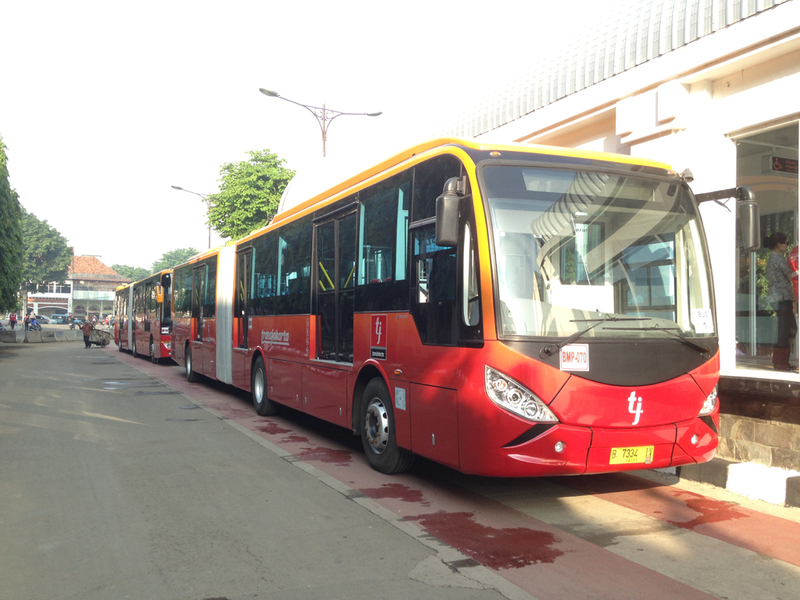 TransJakarta has expanded its networks to surrounding neighborhoods (Bekasi, Bogor, Depok, Tangerang). You will see some blue or white-green buses named APTB (Angkutan Perbatasan Terintegrasi Busway, Busway Integrated Border Transportation). They use the TransJakarta lines, too, but go further to the satellite cities. You have to pay an extra fare to the bus officer, or buy a different ticket from the TransJakarta counter. Now let’s talk about the Commuter Line. Some Jakartans may simply call this as “CL”, while some call this KRL (spelled as ka-er-el), an abbreviation from Kereta Rel Listrik or Electrified Railway Train. For now, the Jakarta Commuter Line has 6 lines: Bogor / Depok – Kota (red line), Bogor / Depok – Kota (yellow line), Bekasi – Kota (Blue Line), Maja – Tanah Abang (Green Line), Tangerang – Duri (Brown Line), and Tanjung Priok – Kota (Pink Line). Most lines are on ground or on elevated ground, but track along Jayakarta to Cikini station is elevated. The red points (see the map below) are stations where trains don’t stop, so you can’t reach Gambir Station by Commuter Train. 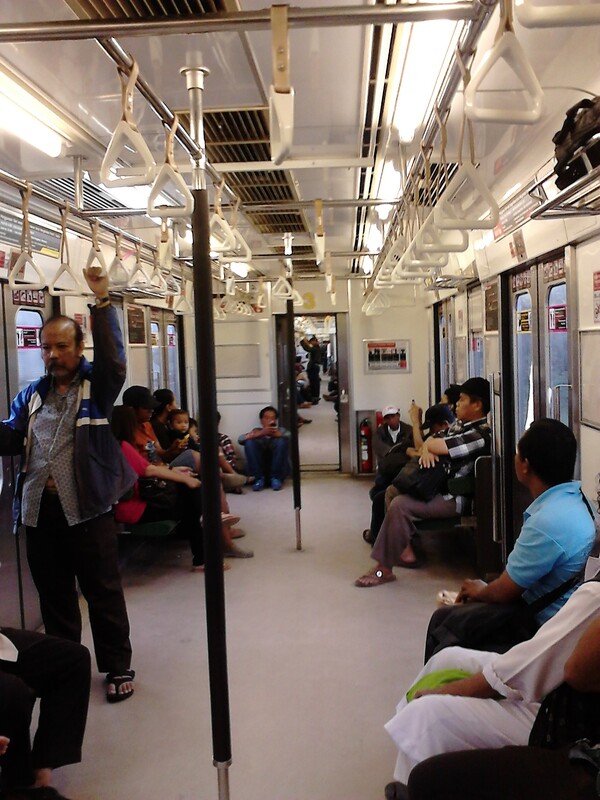 This Commuter Line is an almost-mass-rapid-transit system in Jakarta. Why “almost”? Yes, it carries many passengers, up to 12 coaches per train. But, it still has a schedule, a tight one. Around 15-30 minutes per train. The lines are shared with regular trains with no integration to public places. 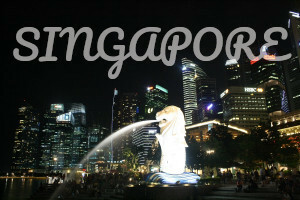 And the network is not as extensive as Singapore MRT or Kuala Lumpur Rail Transit System. 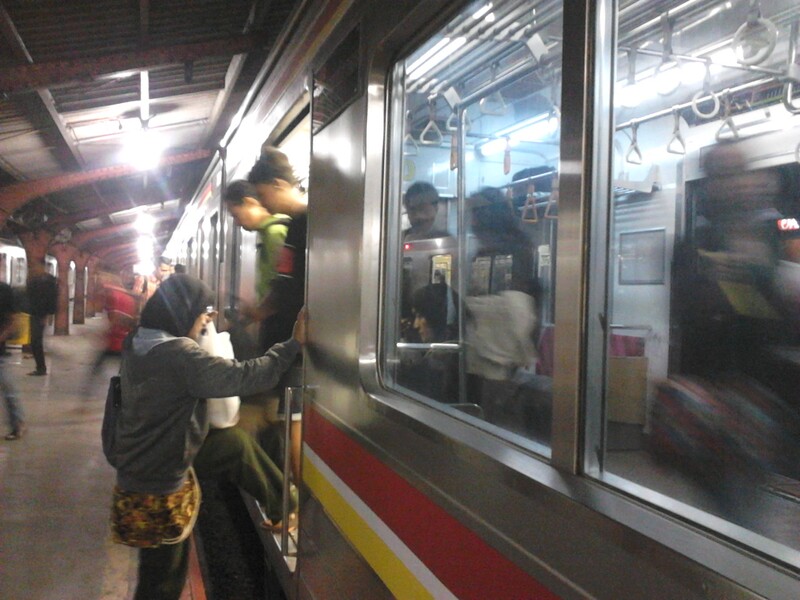 Jakarta Commuter Line uses ex-Tokyo Metro train. So, you Japanese might familiar with the trains. They’re well air conditioned with two rows of seat facing each other. First and last coaches are dedicated for women only. Just like MRT or LRT trains, our trains have automatic doors. There’s a space to put your bag above the seat. If you’re confused about the lines, there is a system map inside the coach as well as passengers rules. Some trains are now equipped with LCD for video advertisements and entertainments. There’s also a voice through speakers inside the trains telling you what the next station is in Bahasa Indonesia and English. There’s no beeping sound when the door is opening or closing, only the officer’s warning through speakers in Bahasa Indonesia. The officer will also inform what line you are taking, reminding some rules on train, and what the next station is. Sometimes you need to change the line. 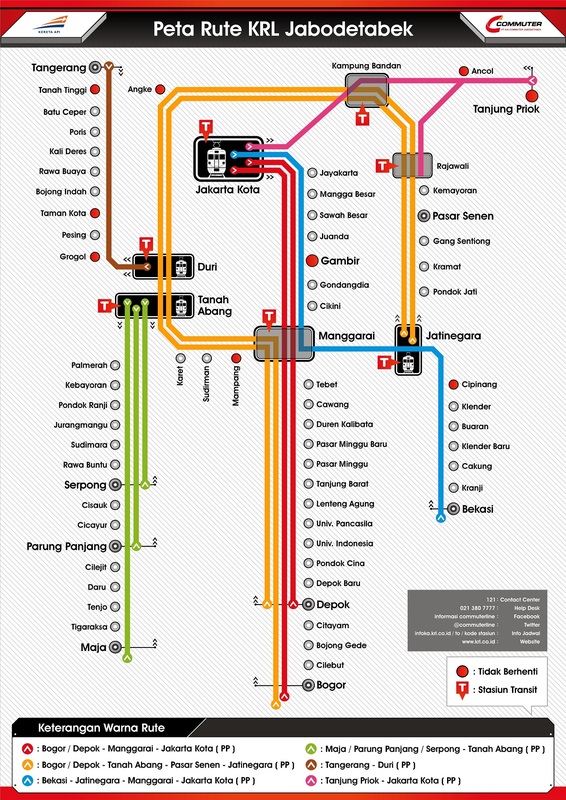 Jakarta Kota, Manggarai, Duri, Tanah Abang, Jatinegara, are the transit stations. The Commuter Line surely run faster than TransJakarta. Goodbye, traffic jam, road congestion. Go to the nearest station and buy ticket from the counter. Say your destination, then an officer will give you a THB (Tiket Harian Berjaminan, Guaranteed Daily Ticket). You need to pay the train fare and the deposit for the card. 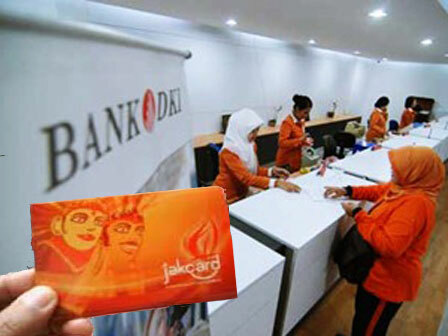 The deposit is IDR 10.000, it will be return to you once you return the card (max. 7 days after the last used). You may use the card for your next journey, but you need to top up first. Go to the counter, tell your destination, and give the card. The officer will register your destination to the card. Update: Horay! Currently several stations (Jakarta Kota, Sudirman, Bogor, etc) have ticketing vending machines. Simply touch the screen, choose whether you want to buy a new single-trip card, reload a card, or use a multi-trip card. Then choose your destination, the screen will show you the price, then click “Proses” and insert the bank note. The machines will dispense the change and the new card. If you want to reload the card or use a multi-trip card, insert the card on the slot, just like ATM’s. How to board the trains? How are the stations? When you get the card, tap the card on the entry gate. The gate doesn’t automatically open or beeping like in Singapore MRT or Kuala Lumpur LRT. So you need to push the gate manually. Tap the card on the exit gate when you reach your destination. Please note that you have to tap the card at the station you arranged before. If not, you can’t pass the exit gate. Mind the sign board, make sure you are at the right platform. The platforms are simple, without any safety doors, but some stations have running text telling you the incoming train. Oh, and make sure you board the right train. Simply ask people, “Kota”? or, “Bogor?” since the tracks are used together. Just like TransJakarta, the platforms and trains would be crowded in peak hours. So don’t take the trip in at busy hours, Monday – Friday 05:00-09:00 AM and 04:00-08:00 PM. The Kota – Bekasi train passing by at Gondangdia Station, Jakarta. The railway is elevated. 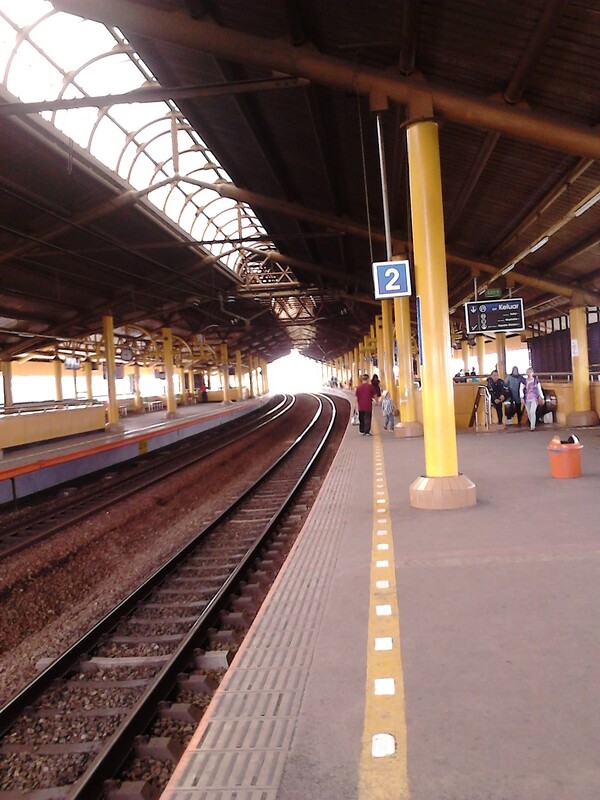 Waiting for my Commuter Line train at Gondangdia Station, Jakarta. 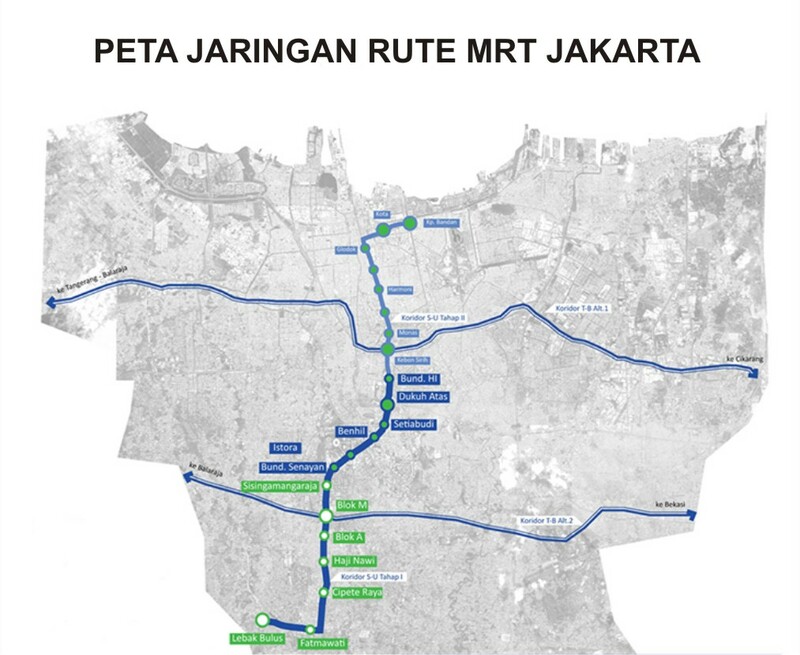 Anyway, Jakarta is constructing a Mass Rapid Transit (MRT) system with 2 lines. The lines will be underground and elevated. The first line (Blok M – Kampung Bandan line, or North South Line) will be finished in 2017. I badly hope this project would be completed as planned, you might know that the monorail project is suspended due lack of money. I hope this post helps. This is my first full-English article, so please apologize for the wrong grammars or expressions. Feel free to ask if you have any questions. Jakarta is not as bad as you think. I love CL! It’s safe, cheap, and comfortable (except at the rush hours). I could go from Kramat to Bogor with only Rp4.500–and I hope with the new fare system, the price wouldn’t rise too high. Extensive and thorough coverage about the capital public’s transport. I bet you’ve experienced a lot about this two transportation mode :hihi. 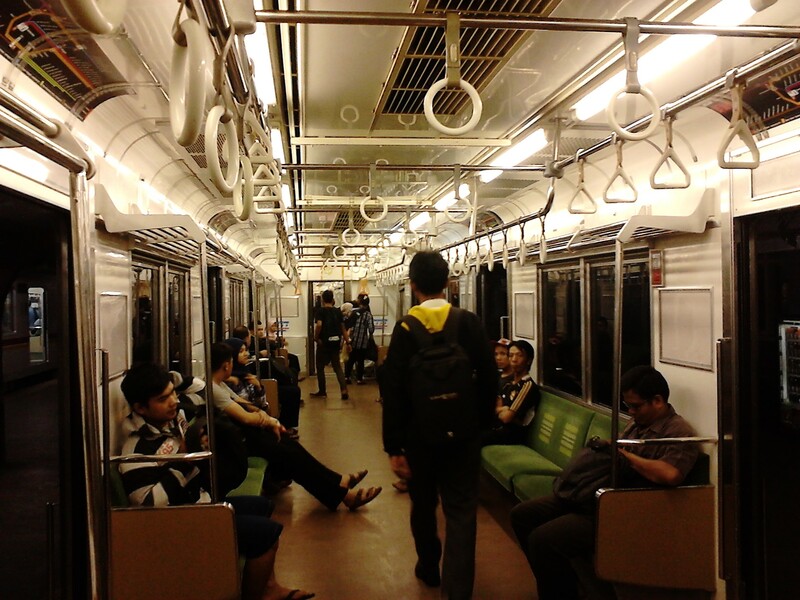 Hai Nuge, I enjoy the commuter line, and like it so much, its better than trans jakarta. Commuter line on time and also very clean. And it is simple to tap in and tap out from one station to another station. Good Commuter Line. A better solution to beat the traffic jam!